We have special prices on a Tuesday, Wednesday and Thursday for OAP’s. Starting from 25% off. 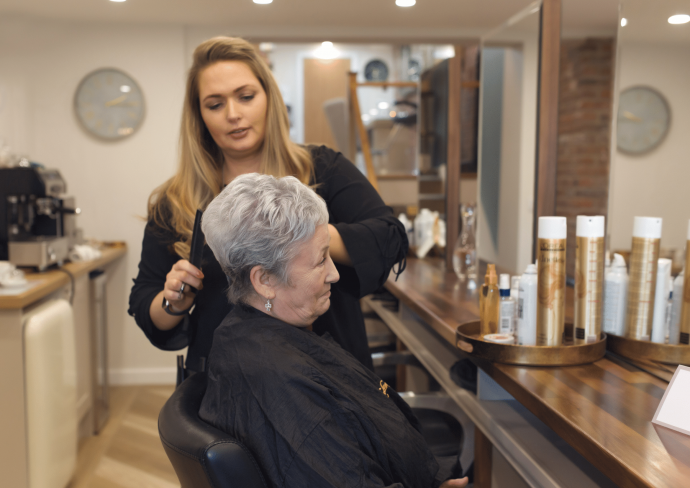 To book an appointment for an OAP Haircut at our warm and welcoming salon in SR4 please call 0191 528 3925 or book online. 50% off with our rising star, Annabelle! We are offering 50% off for new hair clients with our rising star, Annabelle. Annabelle is a brilliantly creative hairdresser already, having recently finishing her qualifications and now gaining advanced skills. She is now looking to build her own client base and is offering this great discount to all NEW clients for a limited time only. All appointments are also fully supervised by a senior member of the team, an offer not to miss. Please call 0191 528 3925 or book online. You must CALL the salon to book this offer. Offer can only be booked within the same week, no advance bookings. All clients will need face to face consultations. All clients will need a skin test. Offer only available with graduate stylists and dependant on the availability that particular week (one discount per new client only) .